Voss Toyota offers a complete lineup of OEM tires from a variety of different manufacturers. 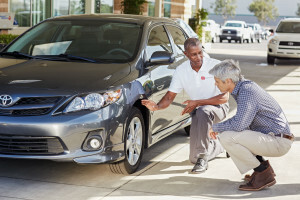 You can rely on us to help you select the perfect tires for your Toyota, because we know exactly what you need to get back on the road, both safely and efficiently. The Toyota Tire Center provides tire options in all approved sizes to meet most customers’ brand preferences. Competitively priced tires are selected to provide an exceptional driving experience with characteristics including superior handling for wet or dry traction, stability, tread life, acoustics, comfort and rolling resistance, which impacts fuel economy. These considerations, as well as load and speed ratings, determine which brands and tire types are approved for use on your vehicle.